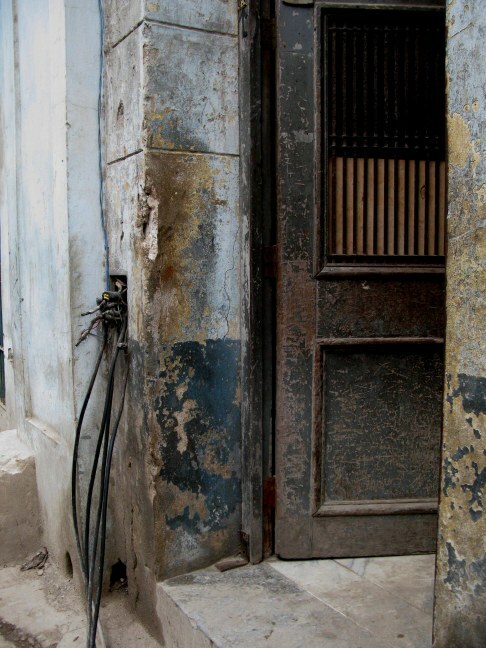 Certainly, the unexpected is what you find in Havana back streets. “You will be very safe here. Don’t worry.There are 2 ½ million people and 1 million policemen”. Where on my first trips there was the policeman on each block to get to know the people, see who comes and goes, with whom and doing what. This visible presence seemed less 'per block' in 2011. Pairs of police officers walking around their beats were still to be seen – and patrol cars made nine circuits in a two hour period when I decided to count. Maybe this replaced the policeman in the dorway of every corner. 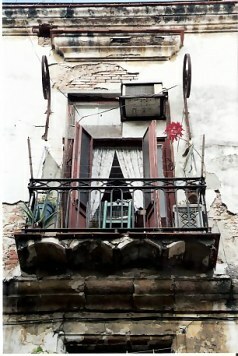 It can cause you to doubt the wisdom of exploring the Havana back streets, but wandering them has always given me so many insights and some marvellous photos. It used to be that a foreigner walking with friends could get the Cuban friends into trouble, but that is no longer the case and that is a welcome improvement. So I walked. 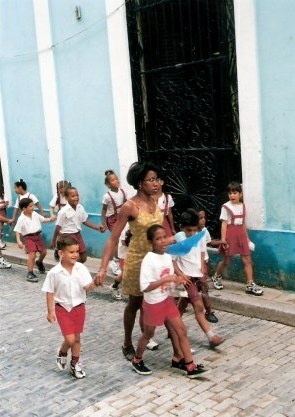 I walked with my friends all over Havana back streets. As I walked, it was always nice to know the Holy Mother was watching over me. In fact, the tiny laminated Holy Mother blessing that my Cuban friend gave me on my last trip has never left my wallet! I was told it was to keep me safe until I came back. Every now and then it falls out and reminds me that I need to return. 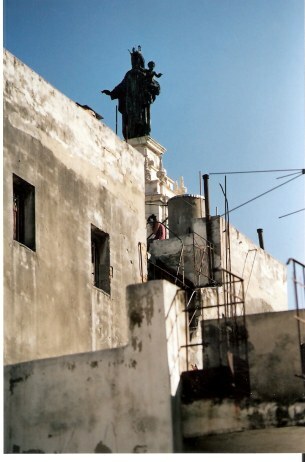 This day I could not help but think what a domestic scene this made on Havana's back streets: here was the Holy Mother and the washing hanging out below her! 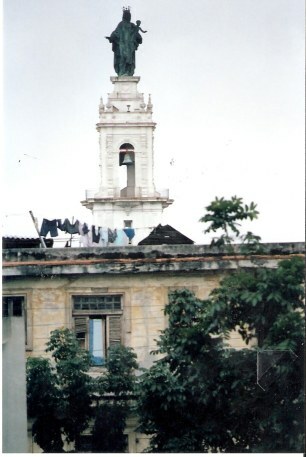 As I looked more intently I saw a more modern sight beneath the Holy Mother’s feet: a young girl perched beside the rooftop water tank, talking on her mobile phone. Here was a vignette of contrast between eras: the young girl represented the new form of worship! The mobile phone has taken off in Cuba, just as it did all over the world. The costs of internal calls on them is not cheap and there is a charging system that defeated my understanding but I noticed that people often didn’t answer the call as they would have to pay. Then, they would either ring the number back from a land-line, or call again putting the magic digits “88” before the dialled number: meaning 'Caller will pay'. In this way there are lots of calls that end in a quick hang up: which seemed to be a code for 'Call me'. 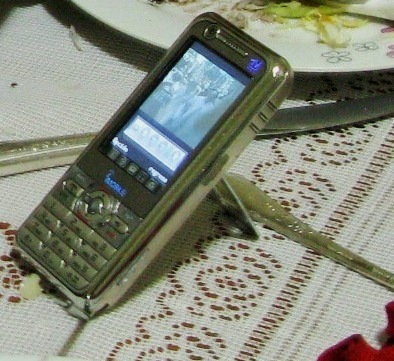 One of my friends had a brilliant phone that came complete with TV viewing capability. The selection of programs is not very wide – or varied – but I was glad to see the Novella still running. This is a sort of latin-american soap opera par excellence (if you like period aristocratic melodrama with quite implaqusible stories in the most wonderful settings and with fabulous costumes). The novella helped me learn Spanish – which over nine years of non-use had evaporated by 2011 and hopefully will return following an intensive course in Alicante - but sadly followed by years of lack of use again so still needing refreshment. The phone lit up like a juke box when it rang, with coloured lights flicking up and down each side in time to the ring-tone. The owner liked the ring-tone so much that it was allowed to play to the end before answering – which was done three decibels above normal conversation – although I kept pointing out that there was a microphone within. 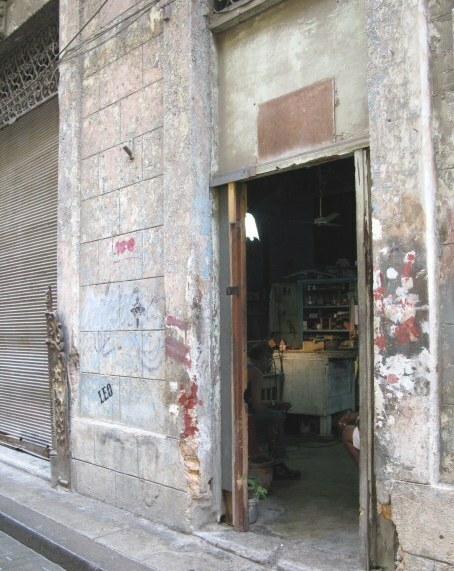 Of course the sound just gets absorbed into the usual rowdiness of Havana back streets – where people playing their different preferences of music (all of them good, I found) were quite unconcerned about the competing volumes of the choices of their neighbours. Due to the costs – first for the phone itself, and then for the calls – the mobile is not yet the item considered a 'necessity' by those in more affluent countries. In the case of our own electronic dependencies, I am drawn to reflect on the words of that thoughtful and much quoted person called 'Anonymous'. but Lord, I miss my mind! Personally, for my 'month with no plan in Cuba', I was cut off rather nicely from the world. My mobile phone suddenly and without any activity known to myself (but could have been friends testing out their German and pressing the wrong button) ceased to communicate with the outside world. It had previously flat out refused to call anyone WITHIN Cuba, though my friends could send me text messages to which I could not reply. Additionally, where in the early 2000s I could eventually (due to the slowness of the connection) read my emails and reply – in 2011 I could SEE that there were emails but could not read them or send a new one – not from any of my accounts. I know that many German and English friends have no such problems so obviously I had the wrong providers of choice. 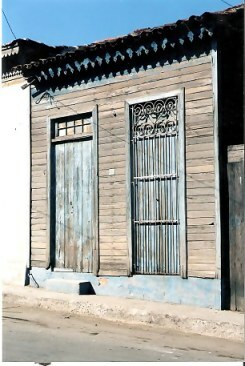 ... and those more humble, like this one in a barrio. I passed many small houses that must once have been the pride of their owners, but for many years have suffered the lack of means for upkeep, like this charming 1920s villa. Further along was a once fine house. Now quite fallen into decay, it nevertheless seemed to retain its dignity. 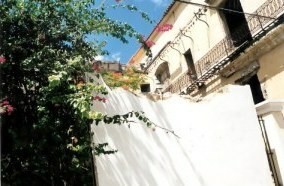 Faded pastel colours and elaborate iron railings were overgrown with a riot of bougainvillea colours. 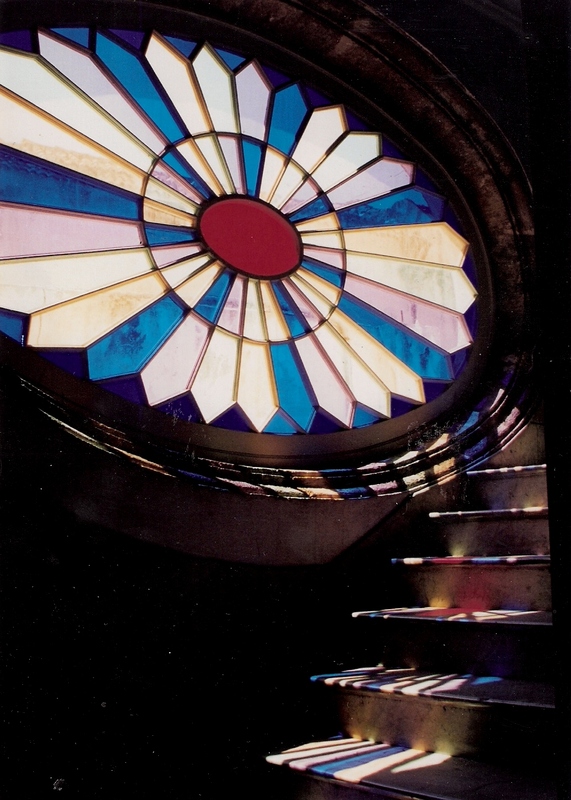 The sunlight seemed to want to reflect the former grandeur of the building - casting shadow patterns across the walls. Rambling Havana back streets gives rear views of houses, and when you see the reality behind once grand facades it reveals the tragedy of the housing shortage in the city. 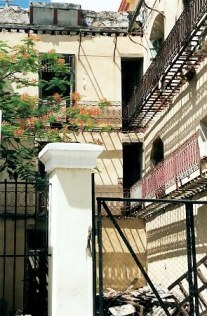 There are not enough places to live – yet empty, derelict but still relatively modern apartment blocks that are 'not for we ordinary Cubans' can be seen. 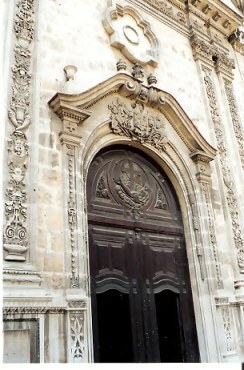 Once restored – and there seemed no activity to do so at the end of 2011 - these will apparently for the foreign workers. 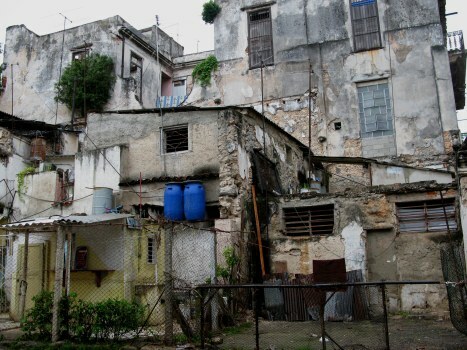 AT the same time, Cubans set up shanty housing and I must say, with Cuban flair they can be made amazingly comfortable with the most unlikely building materials. Havana back streets have a fair smattering of these in empty building sites and corners of builders' yards. Some are in what had previously been garages. 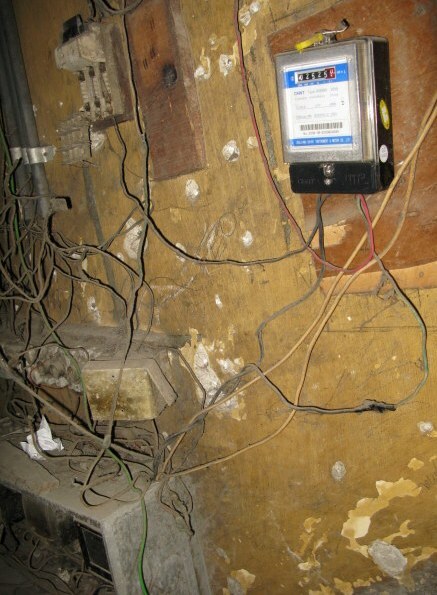 To these, the state may grudgingly give electrical connections and water. Relationships are severely impacted by the reality of having nowhere to live if you break from your partner – and with many generations living under one roof through necessity, it can be a strain for all. This balcony desperately needed repair, but still sported a lovely flower. 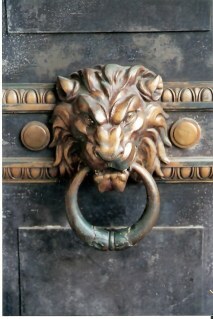 The house to which it belonged sat side by side a restored neighbour, making its forlorn state even more pronounced. In the nine years since my last visit, the roads were definitely worse, and the footpaths as well. The economy suffers of course from the US embargo and as usual, such political points are scored at the expense of the man-in-the-street. 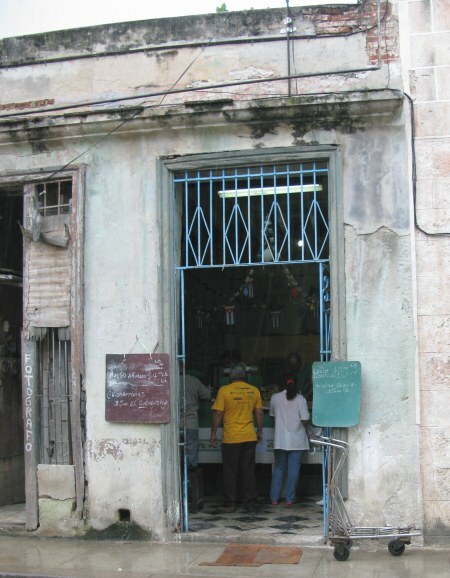 People in the cities still get the Cuban food ration, but as there is a dual currency, and with most people being paid in Cuban pesos, it makes it extremely difficult to exist in any sphere beyond that of the ration if you fall into that group, and don't have the opportunity to earn the higher valued CUC or Cuban Convertible Peso. '… by the pegged rate, the twelfth-highest-valued currency unit in the world and the highest valued "peso" unit'. It is the one for which: 'a single unit buys the highest number of any given other currency or the largest amount of a given item. Most commonly the calculation is made against a major reserve currency such as the euro (EUR), the pound sterling (GBP) or the United States dollar (USD)'. However, Wiki also distinguishes between a high-valued currency and a hard currency, which is: 'a currency with a good buying power and which is widely accepted as a reliable store of value'. This means its purchasing power OUTSIDE the country of its origin may be much better than that of the Highest Value currency – which may just have good local buying power. 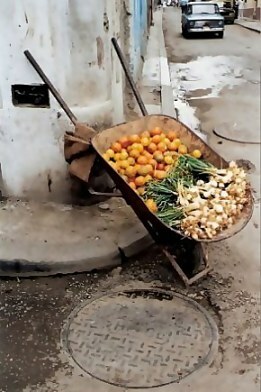 The food ration items can be purchased from approved stores and only with the relevant coupons. 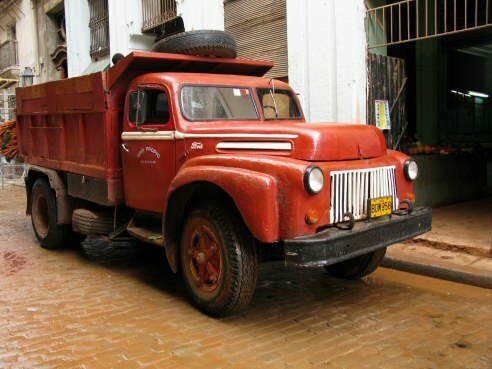 Commodities are trucked in from the country to these shops – like on this classic old truck outside a shop in the UNESCO Heritage area of old Havana . It had a load of carrots. 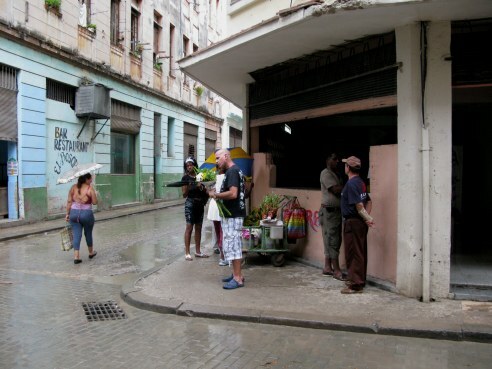 There are 'supermarkets' in Havana and they stock a wider range of goods – but for them the payment must be in CUCs, the currency which we, as tourists operate. Even then, the range of goods from which to select is limited. In the past, (and it hadn’t improved by the end of 2011) I could never find the spices or herbs I needed, so now I pack for my friends a whole range of packets of herbs and spices, packet soups, chopped peel, glacé cherries, candy “sprinkles” for cakes, vanilla beans etc., so they could cook with a bit more variation. Although the infrastructure hadn’t improved over my nine year absence, one very great improvement was that it is now possible within the system to have your own little business. 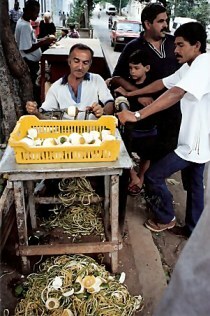 For some this means having the ability to legally sell your home-grown-produce and this you can see in many forms on Havana back streets. 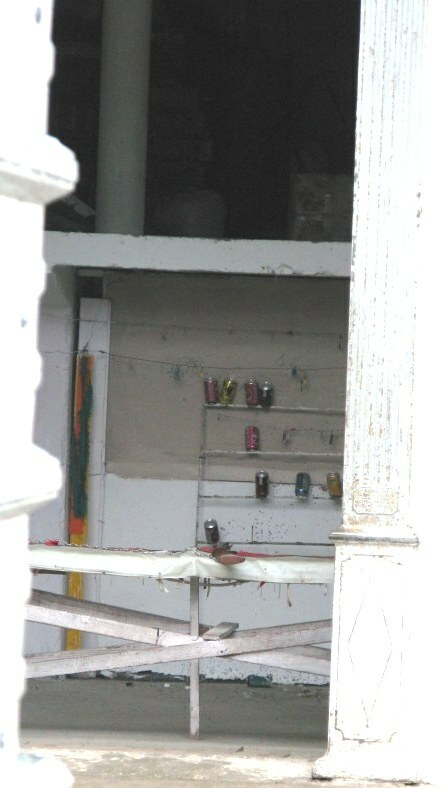 ..or to run a shooting gallery – Cuban style. …let alone the internal arrangements. 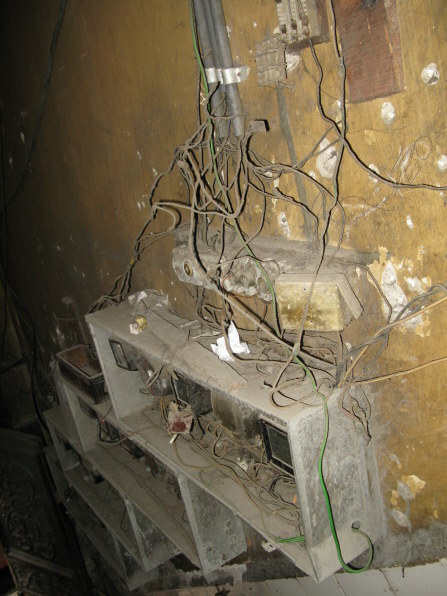 Inside the apartments this 'direct to the mains' connection has wires hand-inserted into the socket. 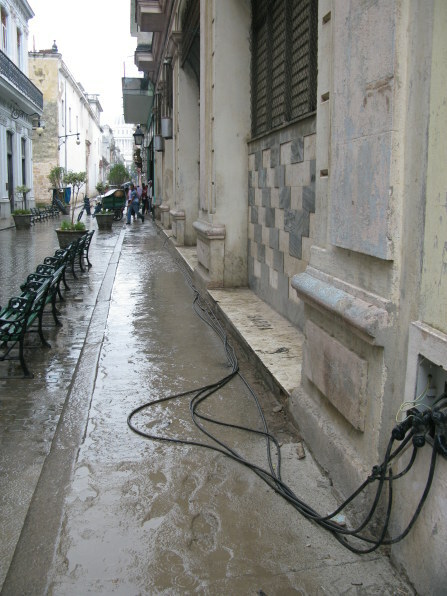 Not only in Havan back streets, but in rural hamlets and inland cities this is quite a normal procedure – as is the round heating bar on a similar electrical wire I saw in another Havana back street. 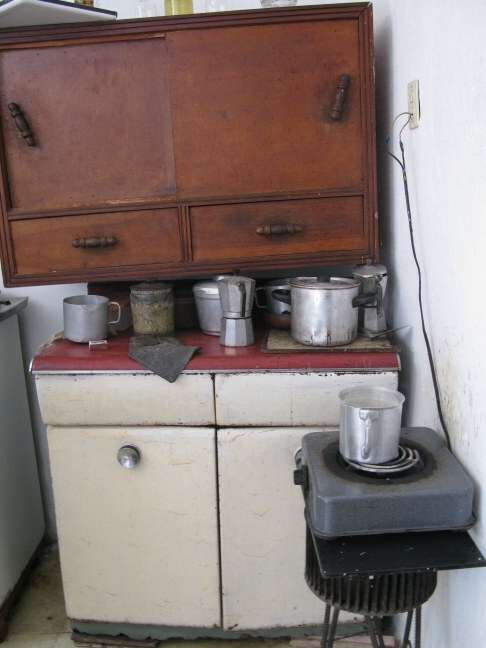 It was connected the same way and then plunged into a pot such as this to heat the water. 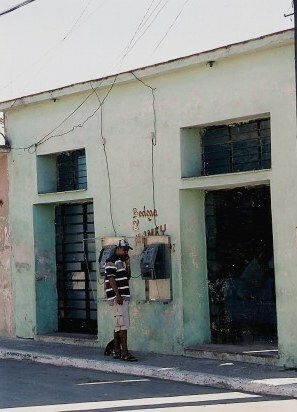 Joking aside, the public phones in Havana haven’t been vandalised and do work, which puts some of our cities to shame. 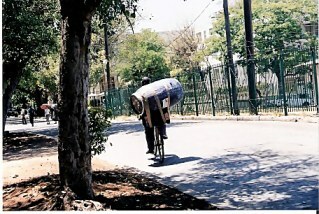 In my back street rambles I was nearly run down while taking photos – by a man carrying a huge wine barrel on his back while riding a bicycle. Gives new meaning to the term 'He barrelled on past'. I passed a class of young school children singing as they walked with their teacher and remembered the striking social comment of the comparative world literacy standards. 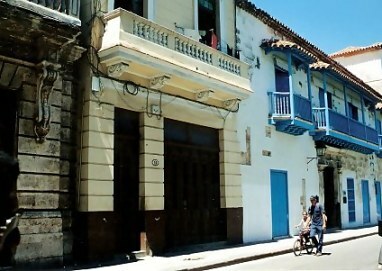 Literacy rates in Cuba are amongst the highest in the world. After spending years living in America, where every week someone would comment on what good English I spoke,which they found remarkable since I came from Australia, I came to realise they were confusing Australia with Austria. One of my work colleagues came back from a recent trip to Austria with a black T Shirt that had a yellow kangaroo on the front – like the road signs. It said: 'There are no kangaroos in Austria'. I got the joke! 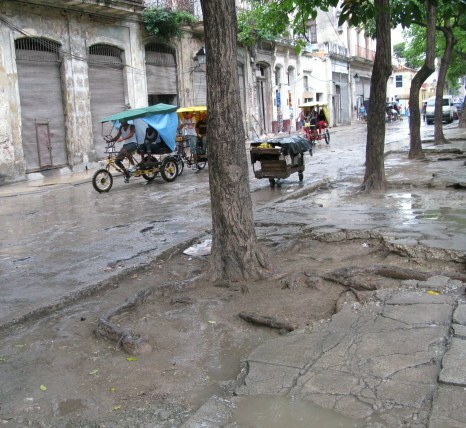 By contrast, in Havana I found people extremely well-informed about other lands. I had a fascinating conversation with a young man who chatted to me on the Prado about the Republican issue in Australia, the recent politics, about Australia being the driest continent, and about Permaculture. Not bad for an unemployed person! 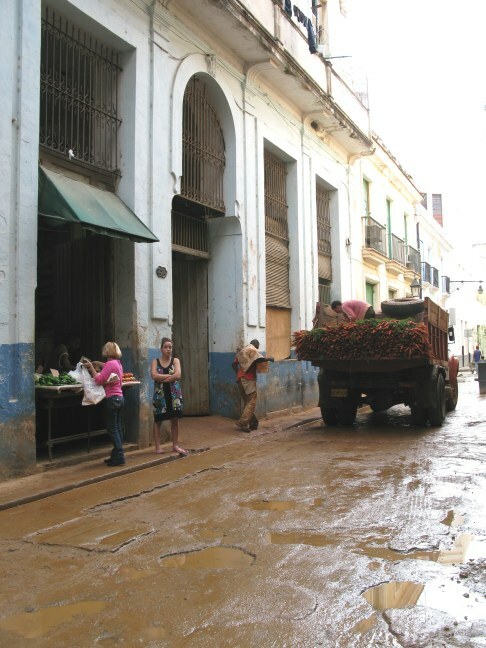 Permaculture is sustainable land use using the existing environment and land contours and is regularly taught in Cuba by Australians. It was through one of my dancing friends being friends with one of the permaculture teachers that I was lucky enough to join a wider circle of Cuban friends beyond the street folk I had befriended on my first trip. Walking with them away on Havana back strets away from the tourist areas I came across the man with the apple peeling machine, busy at work under the trees. I was never quite sure why. Was it a sort of contract coring/peeling service, or did he sell the naked apples on the street? Looking at the photos now, I realise that I never asked. 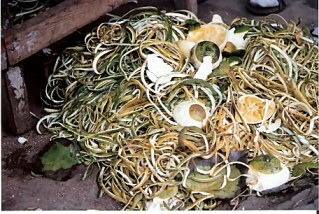 At any rate, both he and his peelings made great photos! 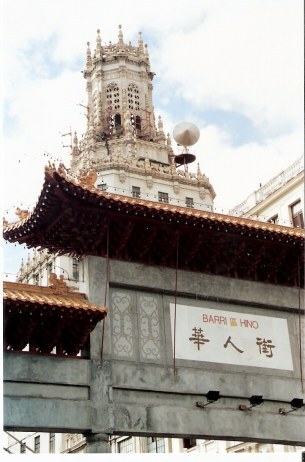 My friends also took me to China Town – Barrio Hino, according to the sign - which over the years has misplaced the "C" in Chino. The food there is unspectacular, but it’s a good place for me when I am tired of cooking for upwards of 10 people and craving something different. Since the food outside a tourist hotel is bland – plus the fact that a diet of black beans and rice with a sampling of pork or chicken gets old after a while to those of us used to more choice - a different kind of unspectacular is always welcome. 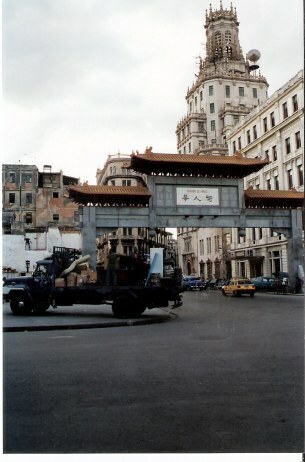 This was once one of the largest and most active China Towns in Latin America (at its largest covering 44 blocks of the city), as Chinese workers were brought to Cuba to replace, or to work alongside African slaves. Inevitably, as their numbers increased, so did the size of Barrio Chino. There are a number of restaurants here, and for some reason Chinatown is exempt from laws that are applied to other privately owned restaurants, so they can have more than 12 seats and also - importantly, serve seafood. These sights and experiences came initially from becoming friends with someone I asked to direct me to the bank on my first trip. Banking in Havana not being a straightforward affair, he stayed to help me through the process and so we talked. 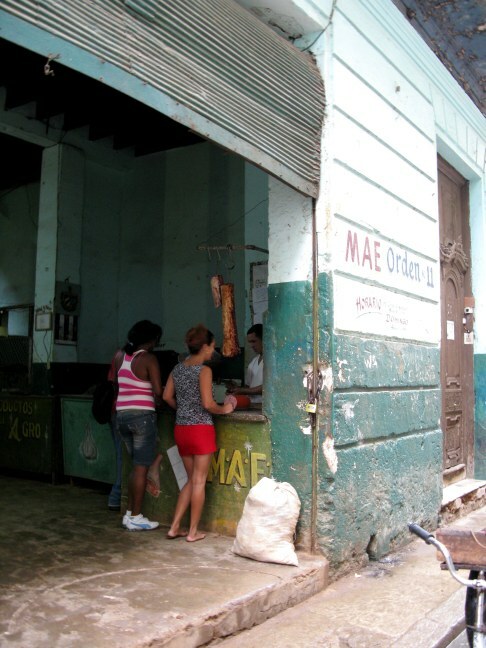 When you learn about the complexity and reality of everyday Cuban life it gives a new perspective. In fact, after six trips to Havana and becoming a godmother to the child of one of my friends, I came to the conclusion that actually NO ONE understands the complexity in Cuba. It may or may not be deliberate. However, to work out how something is done you often need collaboration – with everyone bringing his or her piece of the jigsaw on the subject at hand. Roaming by mistake up a deserted stairwell in Havana I found this wonderful reflection. I have returned there a few times on later trips and never at the exact time to get a photo such as this. As they say: there are no wrong turns, just unexpected paths - and the unexpecetd so often brings us beauty if we only slow down long enough to catch such moments. 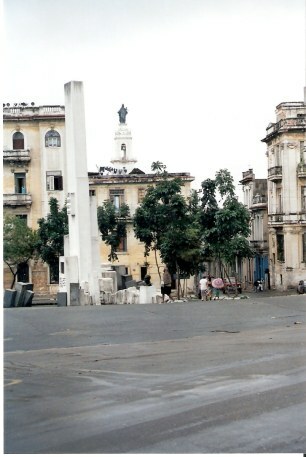 Other tourists have complained bitterly about being approached by Cubans. To know all is to understand all. My friends have been worried about the trust issue. Will I be ripped off by my Cuban friends since I have relatively so much, and they so little? 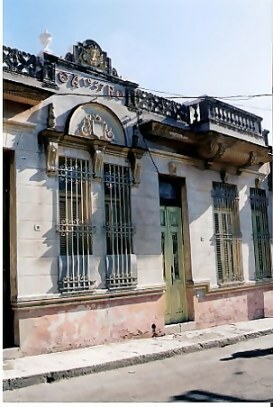 When on each trip I placed my 'kitty' of funds in their hands,I found my Cuban friends made far more economical use of my money than I would have. They took pride in adding the commission earned for bringing me to a restaurant or bar to the general fund.